All swimmers must wear the official Waterdragons swim cap and club top. Your swim cap is essential when racing, so that coaches, officials and spectators can quickly identify you. These can be purchased from the Uniform Officer. 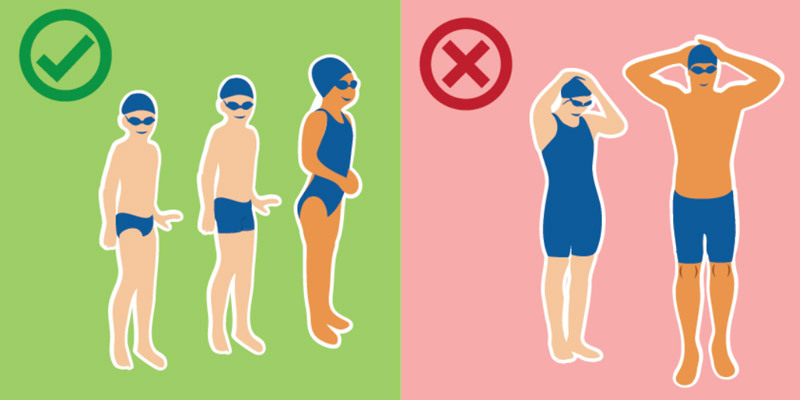 Please note the new rules regarding swimsuits for all competitors aged 11 and under, which came into effect on 1 July 2017. This rule will be enforced at all Swimming Victoria events. You can read more about the decision to introduce this rule and the regulations here. How do I register for swim meets? There are different ways to enter a swim meet. GSI swim meets can be entered via the Gippsland Swimming website. Select the meet you would like to enter and the events. An email is sent automatically to our Entries Officer and a copy is also emailed to the swimmer. Some swim meets outside Gippsland require you to enter direct, either online or on an entry form, e.g. Country Championships, State Championships. Specific instructions can be found on the program for these meets on Swimming Victoria’s website. Our club produces a list of target meets which is distributed to members each season. Which events do I choose? Swimmers should always consult their coach before entering a swim meet to discuss which events to enter. Your coach is the best person to know what events to enter to suit a swimmers’ individual capabilities. For all swim meets that Waterdragons attend, relay teams are entered by the club, using times generated automatically by computer, based on which swimmers are attending a swim meet and their times. This program finds the fastest combinations of swimmers. For example, the four fastest 11/12 year old girls are selected for the freestyle relay A team, the next four for the B team etc. How do I get to meets? We do not have a team bus, so swimmers need to organise how they get to meets. Car pooling can be an option, so speak to other members if you need a lift. How do I scratch from an event/meet? If you wish to scratch an from a swim meet, please let the Team Manager know as soon as possible. Remember you may be part of a relay team, so an entire team may need to be scratched if a replacement cannot be found. A swimmer cannot be scratched from an event until after they have spoken to their coach. If the coach allows you to scratch, please let the Team Manager know as there is paperwork to be filled in to officially scratch you from an event. If the correct procedure is not followed and you just decide not to marshall for an event, you may not be permitted to swim your next event. Listen to your hands and feet!